Enjoy the unique experience that is only recently available – a guided fishing and snorkeling tour of the Sapodillas Cays in Belize. The reefs in this area of the world are second only to the Great Barrier Reef of Australia. There is an incredible variety of tropical fish and as well as a myriad of coral and other sea vegetation – truly a snorkeler’s paradise. It’s also a fisherman’s paradise whether you are a novice or seasoned fisherman (woman). This tour offers deep sea fishing as there is a major drop off from the reef to the deep sea as well as reef fishing in the shallower areas. For fishing enthusiasts there is trolling for Grouper, Wahoo, and Great Barracuda, Big eye Tuna, Kingfish, Spanish Mackerels and Black fin Tuna. The bottom fishing harvests Mutton Snapper, Grouper, Red Snapper, Yellowtail Snapper, and a colorful variety of highly delicious other Reef Fish Species. Minimum of 5 Days for “Parlama Tours” but please enquire about our shorter trips that are available without our sport fishing launch. Seal Cay – Tom Owen’s Cay- See Details at bottom of page. Prices start as low as $195 USD per person per day based on a four person tour and include transportation from Guatemala City or Antigua to Rio Dulce and return. All meals, accommodations, fishing boat and guides, fishing and snorkeling gear, and tour fees are included. Not included are tips or alcoholic beverages. Let us know the number of people in your party and your interests and we will customize a tour for you!!! For Fly Fishing enthusiasts there is the ever popular Bonefish and Permit which are plentiful in the shallows of the beaches surrounding several of the Sapodillas Cays. The Flats Barracudas (a real heart stopper) are plentiful and give great fighting action. We also offer the opportunity to go Tarpon fishing. If you’ve never experienced a school of around 100 tarpon splashing and leaping out of the water (they weigh in the neighborhood of 60 – 120 lbs.) then it’s an absolute must see and do. Catching one is the experience of a lifetime. Snorkeling- For those of you who enjoy viewing the underwater sights you are truly in for an amazing experience. On calm days the clarity for snorkeling is absolutely amazing – the water is crystal clear for optimum visibility for about 20 feet. A lot of the coral is from 5 feet to 15 feet deep so easily visible right from the surface. 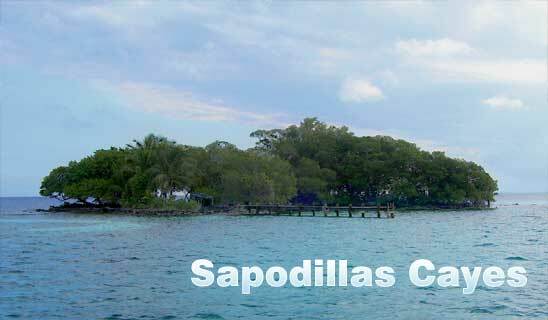 The Sapodillas Cays is a protected area and in recent years has been declared a World Heritage Park. This means that commercial fishing of any kind is no longer allowed. Therefore the marine life is flourishing – it’s an astonishing feast for the eyes. You will see Sea Turtles, Rockfish, Hogfish, Barracuda, Sharks, Stingrays, a myriad of colorful and vastly different corals such as deep purple Sea Fans waving in the underwater current, Brain Coral, Sea Sponges of various colors, Stag horn Coral, Fire Coral, and many others that you will have fun trying to identify. There are all kinds of sea life in the coral – some Coral Heads are like a small world of their own with their own eco structure – you will see Rock Crabs and Lobsters hiding in the Coral Caves as well as the spiny purple Sea Urchins, Anenomoes of various sizes and colors, as well as many varieties of small and larger colorful coral reef fish – the black and yellow striped sergeant majors, the blue fluorescent damsel fish, fabulous schools of Blue Tangs who suddenly change color when they change their course and the sun strikes them another way. They go from a deep cobalt blue to a powder blue with orange tinges. There is nothing like swimming slowly through the coral and being joined by a school of hundreds of graceful Blue Tangs!!!!! Sometimes you will encounter hundreds of thousands of tiny neon fish – it’s quite the experience to watch the sun catching their rainbow colors and to see them parting every which way as you swim through them. The sight of an Eagle Ray elegantly gliding through the water with its six foot wingspan is truly something to behold. Seeing a Green Moray Eel poke it’s head out of it’s cave for a feeding – Tom Owen’s Cay has a few resident Moray’s that are fed by fishermen cleaning their catches – is also quite the sight to see. The Sapodillas also provide some pretty incredible Bird watching. The Arctic Terns have made their nesting grounds on Tom Owen’s Cay (months of April to July or August). Right from your hammock on the upper porch of your room you have a “bird’s eye view” of the Terns as they feed their young and interact with the rest of their flock. There is also an Eagle’s nest right offshore of Tom Owen’s Cay where two Ospreys have taken up residence. They can provide hours of entertainment watching their daily activities. One of the most spectacular sights to see is when an Osprey takes a triumphant soar around the whole Island showing off his recent catch of a large Red Snapper that is larger than he is. His talons clutch the fish tight and the fish arches his body and splays his fins in outrage, trying unsuccessfully to flee his fate. The Osprey is indeed triumphant – what a magnificent creature! Those are just two examples of the bird life but there are many marine bird’s to be seen at various times of the year. Some of them help us spot the schools of fish. We watch for them out on the open sea when they follow the schools of bait fish that the larger fish are chasing. There are a couple of nighttime activities on the Islands. Since there are no lights for miles and miles you can see an incredibly clear sky so stargazing is at an optimum. See if you can find some of the more common constellations. Also, if you take a flashlight down to the shore you can spot all kinds of marine life – the fluorescent orange shine of Shrimps peeking out from all over, Spiny Lobster, Brittle Stars as well as the phosphorescence of tiny sea organisms. The night is also a good time to spot the Moray’s. Of course, the other more obvious night time activity is probably one of the soundest sleeps you’ll ever enjoy with only the sounds of Mother Nature – balmy Caribbean breezes and the sound of the waves lapping up onto the shores. Seal Cay – Rooms in 2 Large Yurts (Semi-Permanent Tents with wooden floors and latticed wooden wall bracings, comfortable double and single beds, lounge and bar area, bathrooms and fresh water showers – maximum capacity 10 persons. Tom Owen’s Cay – Small Stone Yurts for single or double occupancy and hotel rooms that are somewhat rustic but very clean and with a lovely seaside ambiance and artistic flair. The whole hotel is made of washed up coral pieces and cement. There are lovely tile mosaics in all the rooms and the main lobby and bar area as well as beautiful seascape wall murals. Sleeping capacity of up to 14 persons.